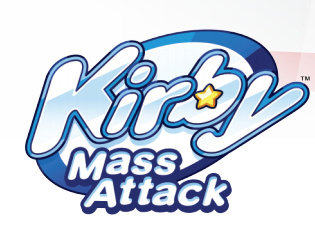 DS owners, don't think you were forgotten at E3 — Nintendo is rewarding your love of the non-3D dual screen console with a brand new Kirby, called Kirby: Mass Attack. The game sees multiple Kirbies used to overwhelm your enemies, as the press release describes. One day, an evildoer with a magic cane appears and splits Kirby™ into 10 pieces. Kirby sets off on a journey to return to his original form. Players use the touch screen to control a mass of Kirby characters in a new and novel way. Swipe the touch screen to launch them in a mass attack against enemies, then tap the enemies into submission. Players use the stylus on the touch screen to control a swarm of up to 10 Kirby characters at once. They can help players defeat enemies and find treasure. The number of Kirby characters under a player’s control is important, as some challenges require a specific number of Kirby characters in order to be solved. When the number of Kirby characters is increased, players can gain the upper hand. When can you play with these Kirbies? 19th September, that's when. Sweet, I am going to buy this on day one! @NintyFan: They kinda had a cameo mention in that last shot with all the game logos on it. Along with Mario Party 9. When is it out in eu? Nice logo. Pretty tough name. We'll see if it's good or not. The name is too similar the the other DS Kirby. I still don't know why they changed Squeak Squad to "Mouse Attack". Because of the picture caption, I now want to see a Mass Effect game that uses Kirby characters...MAKE IT HAPPEN BIOWARE!!! Regardless, this game looks pretty awesome. I'm a huge Kirby nut, so I'm going to buy it anyway no matter the quality.